Have you heard them? They are out there. Just listen and you can hear them. The fans. The media. The talking heads on TV. The radio talking heads. Everybody. It won't stop. Well, it won't stop until Sunday. We hope. Donovan is too muscle bound from working out in the off-season. Donovan just got married and he is working on the " honey do's" from his wife. Donovan is doing too many commercials and he is not focused on football. Campbell's chucky soup, Lincoln Financial and Tastycake. Donovan's foot injury has slowed him down physically. Donovan hasn't been the same since his big contract signing. Donovan doesn't have his lucky beard. Donovan's stars are aligned in a negative way and are affecting is judgment. Donovan aura is orange and not blue and it is affecting his mood. A man in NY has a Voodoo doll of Andy Reid causing him to call bad plays for Donovan. The man is Rich Kotite. The Linc is not home field yet. Donovan is not used to the grass. You get the idea. Analyze this. Analyze that. That's what we do when our team and our QB was awful and we can't figure out why. I certainly don't know what is wrong with Donovan. I'm not even sure Donovan knows what wrong with Donovan. This coming Sunday, we will all find out. If all goes well and we win, the world will be right again. Hahuna Matata. If we have another round of what we have already witnessed, we may need a s�ance to invoke the spirit of Sigmund to help us understand what is wrong with Donovan and to talk the mournful and depressed fans away from the Ben Franklin bridge. This Eagle team can't go 0-3. 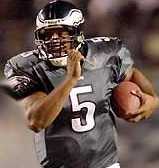 Will the REAL Donovan McNabb please stand up?? ?